This is a review of Natureplex Athlete’s Foot Cream. The manufacturer claims that this product will cure athlete’s foot caused by most types of fungus. They also claim that the cream will provide instant relief for the symptoms of athlete’s foot while moisturizing and soothing the skin. Read on to find out is this is athlete’s foot treatment is right for you. The active ingredient is Clotrimazole, which is an azole antifungal that inhibits the growth of certain types of fungus, including athlete’s foot, ringworm, and thrush. Because it contains aloe, this cream will likely provide at least temporary relief from the irritation of athlete’s foot. The product is to be applied twice daily (morning and night) in a thin layer on the affected area for 4 weeks. For maximum effectiveness, it is necessary to thoroughly wash and dry your feet and then wear clean, dry socks. Possible side effects of Clotrimazole include burning, itching, redness, swelling, and peeling at the site of application. The manufacturer of this particular Clotrimazole product does not list these side effects specifically but recommends contacting your physician if you experience irritation while using it. This product is available online for as little as $3.99 for three 1.25 oz. tubes. The vendor offering it at this price claims that this is an 87% discount on the regular list price. Another vendor offers a single 1.25 oz. tube for 88 cents. Other products containing Clotrimazole are significantly more expensive. The low price of this product may reflect a lack of quality. Some customer reviews complain that it does not work at all as it is a “cheap” product. The majority of customer reviews, however, praise this product as being a great treatment option. According to their website, Natureplex offers a satisfaction guarantee. If you are not completely satisfied you may return the unused portion of the tube for a full refund of the purchase price. However, given the very low cost of this product, going to the trouble of returning it to the manufacturer is probably not worth the time or shipping cost. 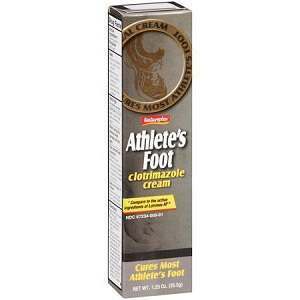 The active ingredient in this product, Clotrimazole, has been shown in clinical studies to be somewhat less effective in treating athlete’s foot than other antifungals. The price of this particular product suggests that it is of low quality compared to other Clotrimazole creams. Some customer reviews claim that the product does not work at all, while others say it works quickly and very well. This variation may be due to different types of fungus or improper use of the product. Because the price is so low and it is available over the counter, it may be worth it to try this product before trying more expensive alternatives or visiting a physician to obtain a prescription. Jimmy Rodriguez	reviewed Natureplex Athlete's Foot Cream	on June 23rd	 and gave it a rating of 3.